Thursday I was completely angst out about my impending Half marathon in Cleve land, OH this weekend. I felt the butterflies in my stomach, my eyes were tearing up, my anxiety levels shot through the roof, as I considered the wretched thought of keeling over mid run and my friends having to drive to me hours later to peel my carcass off of the asphalt and carry me home with a utter sensation of defeat and failure looming over my head like the rain cloud that followed Eeyore around. Why is this a peculiar thing to being experiencing for me? Well, this isn’t my first half marathon, in fact it’s my eight AND I’ve run 3 marathons on top of that, so I should feel like a pro at this point. “So, what’s the deal, tootse?”, you may be inquiring. Well, I’m psyching myself about how fast I will be able to run it. I have this tier of times that are acceptable running (No pun intended) through my head. I have the notion in my head that I will perhaps barf upon crossing the finish line from rocking out. I also have this idea that I WILL bawl like a baby if I get that PR (Personal Record) in this race. 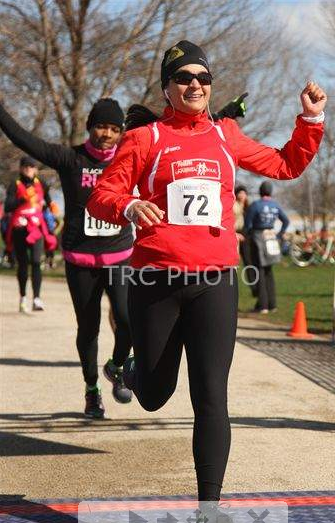 When I ran the CARA FirstMerit Bank Lakefront 10 miler last month, I PR’d like a MoFo by 20:23 minutes. For those of you not big into running, that’s a pretty HUGE deal. That’s a 2 minute shave from each mile. I crossed that finish line with a smile on my face and once I realized what I had accomplished, I blubbered like crazy! I got looks. People thought I may have been injured, but I couldn’t control myself. I felt as if I won a gold medal in the Olympics and was so over the moon, I just couldn’t stop for about 10 minutes. My friend saw me squatted crying into my hands and came by to ask me if I was okay. All I could muster out of my mouth was, “I just got a PR and I can’t stop crying!” She hugged me and congratulated me and said to cry away and enjoy the elation. I also ran a 5k last weekend and earned yet another PR in a 5k race, by almost two minutes, which is just as huge of a deal as the 10 mile PR. 10 miler: Notice my break in form at the end. So basically, I’m on a roll lately and my friends on my race team are high-fiving me, giving me knuckles and telling me I’m crushing it. All of this attention I’ve garnered, without request, has made me a little timid and apprehensive about this half marathon. AND the pressure is ON like cray this weekend as I hope to get a 15 minute PR. If I don’t get this, I’ll deal, but even a seven minute PR will suffice (I told you I had a tier). Can I do it? I’m certainly praying for the ability to do so, but we shall see! I’m running this race with two good friends (We call ourselves the Three Musketeers) and it’s my friend, Amanda’s first half marathon and she’s just as nervous as I am. As I realized this is bigger for her than it may be for me, it’s helped me chill out a bit. I want her to enjoy the race and have a good time, so I’ve been trying to curb the nerves. So far it’s helped, along with the fun and distracting entertainment provided via road trip to Cleveland with other friend, Bruce. All in all, at the end of the day, I must come to the realization that this is “just a race” and you have good ones and bad ones, but it’s definitely tough to put it out of your head. Today we go to the Expo to pick up our packets and meander about for a few. Then, we plan to go to the Rock ‘n’ Roll Hall of Fame, rocking out before we have our early lights out. By this time tomorrow morning, I hope to be almost to the finish line of my eight half marathon, with a PR and medal awaiting me. I also have this bizarre idea that once I get to the finish, I will immediately mark the occasion with a medley of barf and tears, but we shall see. Wish us luck!